Powers/Abilities: The Blank wears a personal force field belt which protects him from most harm, allowinghim to slip through the grips of others, and rendering himself and anything he holds in his hands "blurry," making him impossible to identify. The belt is bonded to his body and central nervous system, and cannot be removed without delicate surgery. 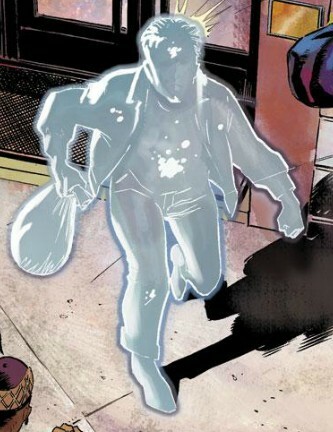 Clothing and other items held close to the Blank's body also benefit from his force field's effects. He is able to blank out only part of his anatomy at a time if he so chooses. However, since being merged with the belt, he has to concentrate to switch off the field, an act that is becoming increasingly difficult. He usually carries a handgun. History: (West Coast Avengers I#2 (fb))- While waiting for a bus, an unnamed man had a conversation with a former employee of Stark International, who had left the company, disgruntled by Obadiah Stane. He told the man how he had an invention in his suitcase that would make him wealthy enough to one day purchase Stane International, but was so distracted by his conversation that he stepped off the curb into the path of an incoming car. The man stole the briefcase from the inventor, and eventually learned how to operate it. 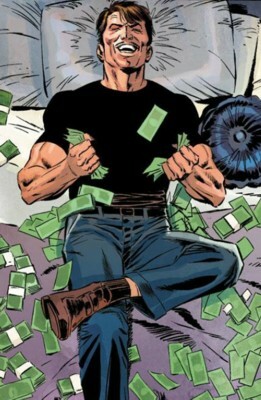 (West Coast Avengers I#2)- The Blank robbed an L.A. bank in broad daylight, attracting the attention of Wonder Man. During their scuffle, Wonder Man's glasses were knocked off, and his red eyes startled by-standers. The Blank used the confusion to escape, switching off the device so that he could slip into the crowds. He returned to his apartment, delighted at the panic he had caused, as he recharged his force field. For his next job, the Blank stole aboard a Wells Fargo truck just as it set off and tried to force the driver to pull over, but the driver refused; the Blank took what he could and departed. However, he was spotted by Mockingbird of the Avengers, and soon found himself surrounded by her, Hawkeye and Iron Man at a gas station. Desperate to escape, he flung himself into a gas pump, knocking it over. Gas spilled over the pavement, and was ignited by the electrical cables torn out of the pump. While the Avengers fought the fire, the Blank escaped. He planned to get out of town once he had recharged his force field again, but as he turned on the recharging device, he saw an image of a man begging for more power. 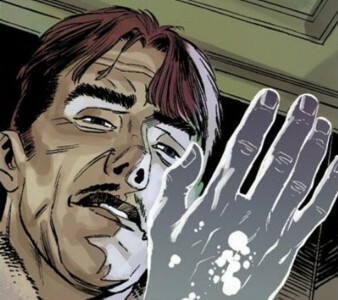 The energies released the man-- Graviton-- from the dimension he had been exiled to by the Avengers, and Graviton was interested to learn of the Blank's troubles with the Avengers, and offered to join forces. (West Coast Avengers I#3)- Graviton began to take control of Los Angeles' criminal elements, using the Blank as a figurehead. The Blank confided to Graviton that he was afraid of facing the Avengers again, much to Graviton's disgust. When the Shroud came to meet with the Blank, using a disguised Wonder Man as a bodyguard, Graviton came to the Blank's rescue, casting Wonder Man aside. Tigra joined the fight, tackling the Blank and incapacitating him. Graviton was annoyed at the Blank's easy defeat, and cast him, Tigra and the Shroud into the Pacific Ocean, no longer having any need for the Blank. (West Coast Avengers I#4 (BTS))- Although the Shroud and Tigra were rescued by Iron Man, he found no trace of the Blank; he assumed that the Blank was caught in an undertow and died. (Amazing Spider-Man II#580 (fb)) - However, this was not the case. The Blank eventually washed ashore on the island of Catalina. However, he discovered his force field device had been scrambled and merged into his central nervous system. Desperate to have the device removed, the Blank eventually resumed robbing banks in order to afford the price of a doctor who offered to remove it. The banks which the Blank hit were predatory lenders which resulted in the Blank receiving public acclaim as a folk hero of sorts. 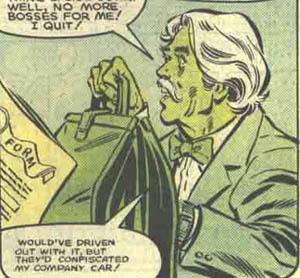 (Amazing Spider-Man II#580) - The Blank held up a Metrobank where May Parker was doing her banking. When a guard shot at him, the bullet ricocheted and hit the guard instead. May phoned her nephew Peter who arrived on the scene as Spider-Man. Spider-Man tried to catch the Blank with his webbing, but it couldn't stick to the Blank's body. Spider-Man punched the Blank into the path of a bus, but the Blank avoided being hit and slipped away, escaping the hero. In his hotel room, the Blank observed a television address by FBI agent Derek Freeman and chuckled at their inability to catch or understand him. The next day the Blank attempted to rob an armored car. One of the guards was prepared with a gas bomb, but the Blank had brought a gas mask. Removing the guard's mask, the Blank knocked him out then took over the controls of the armored truck. However, FBI agents led by Ray Donovan had been monitoring the truck and began to pursue him. Spider-Man had been trailing the FBI and reached the Blank first, knocking over the truck. The Blank emerged from the vehicle for another fight, but Spider-Man dodged his bullets. The Blank knocked over a lamp post to slow Spider-Man down, but the hero saved the bystanders who had been imperiled. Catching up to the Blank, Spider-Man unleashed a torrent of webbing until it became so thick that the Blank was encased within a sphere of webbing. Spider-Man took some pictures and rolled the Blank into the FBI's hands. Comments: Created by Roger Stern, Bob Hall and Brett Breeding. Blank got a full entry in Marvel Legacy: The 1980s Handbook. The unnamed inventor of the Blank's device was a former employee of Stark International who was fed up with the way Obadiah Stane ran the company after purchasing it, and quit, determined to use his invention to become wealthy enough to buy Stane International. However, he was killed by a car, and his invention fell into the hands of the Blank.